Yesterday I spoke my new hostess for today to go through the last little details. She told me that I should be listening to the CBC Radio One the next morning as she would be interviewed about �being a hostess for Ramon�. So this morning I woke up early to listen to the 7.50am interview where this lady on the radio asks Maddi Newman in 108 Mile Ranch all kinds of questions about me going to stay at her place. That was quite surprising. She also announced that I would be hitchhiking up to �108� and that anybody who would see a guy in a red winter jacket hitchhiking along the road should take him along. After breakfast with Ruth Clarke I packed my belongings together again. So my next destination is 108, but I wouldn�t have to hitchhike all the way. Ruth offered to drop me off, one hour (!) from here, in Cache Creek. That�s where the highway northbound starts (and the counting of the miles). I was very happy that Ruth took me along for this morning drive and we drive along the long Kamloops lake, through the jagged brown valleys towards the small highway junction with a few houses which they seem to call Cache Creek here. Ruth dropped me off just north off this hamlet. I thanked her for letting me stay at her place. According to the temperature meter in my jacket is was some -5 degrees Celsius, but I wasn�t dressed specially for cold. It wasn�t that cold either. After fifteen minutes of hitchhiking (there comes a car, there goes a car�) I only felt my head becoming a bit solid. Fortunately I didn�t have to wait too long for a ride up north. A man named Peter was on its way from Salmon Arm (east of Kamloops) to Williams Lake and took me along all the way to the gas station at 108. As I was leaving Cache Creek to return home, I saw a Westfalia van stopped at the side of the road with the flashing lights on. I stopped to inquire and found a couple with an 11 month baby, and a van that had stopped dead. As they were headed to Kamloops I offered to bring the mother and baby with me and the father stayed until the tow truck arrived. I am glad I did as the father had to wait almost 2 hours before everything was sorted out and the van was brought into Kamloops. I had a delightful afternoon with two guests, Sharon and 11 month old Baby Ruby. They just made themselves at home in the house as I handled a number of business phone calls. Max the cat enjoyed having the extra attention as well. The van got fixed and they got back on their way about 5 p.m. Their ultimate destination is Fernie in the South East corner of the province. Had I not driven you to Cache Creek, I would not have been driving by to see their broken van. Thanks for giving me a reason to take a morning drive. Ruth. The ride with Peter was long but easy. It�s actually just one straight line up north, with here and there a few hills we had to get around and valleys we had to cross. But after 108 miles we arrived in 108 Mile Ranch, where I got off and thanked Peter for the drive. At this gas station, apparently the only one in the area, I made a call to Maddi Newman at the payphone and within ten minutes she picked me up. She picked me up with her car and her puppy Labrador Tinga was joyfully awaiting me in the back. Once in the car I got licked and bitten from all sides and it wasn�t Maddi! First Maddi had to buy some groceries for tonight and tomorrow and picked up the mail at a collective mailbox in 108. Don't let the name fool you: the 108 Mile Ranch is more of a residential resort than any kind of cattle operation. Historically, en route to the great Cariboo Gold Rush, a few of the travelers settled here, carving out a place in the woods, on the rolling hills and along thousands of lakes. 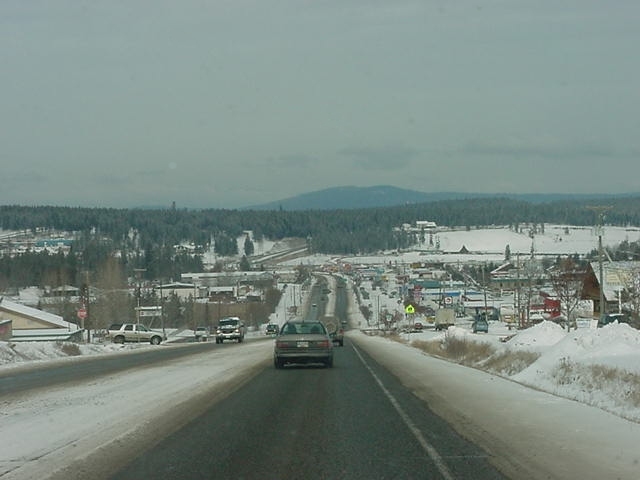 Although the area used to be devoted to ranchland, it was developed in the 1970's as a residential area that offers a winning combination of rural and urban living. It must be popular: the 108's population now numbers well over 2,000 - more than the town of 100 Mile House. At their home, surrounded by woods (and lots of snow!) I met up with Maddi�s husband Jeffrey. Both of them are at work at home. They are both very present on the Internet and Maddi is a graphic designer and Jeffrey is a professional web designer. They did a great job with their web pages and made it quite easy for me know. I don�t have to introduce them as you can read their bios online, hehe. After a sandwich bite for lunch, Maddi and me take the dog for a walk outside. The weather is great and the whiteness of the snow is almost blinding me. I have not seen so much snow in the valley stretched in front of me for a long time! And having a good walk through the snow is good for the body too! At their home Maddi and Jeffrey have their separate offices to do their work. During working hours they are very busy and actually communicate with each other through ICQ! At Maddi�s office I set up my laptop and I could hook on Maddi�s high-speed connections to the Internet. It was today when I started my search for possible support to travel to the northern territories of Canada, which has always seemed impossible. I had one invite in far-north Kugluktuk (Nunavut province), but knew the chance would be very small to get there. But since last Saturday�s radio appearance on the CBC Radio, I got many more invites from remote areas in Canada. And also more from Nunavut. This person actually has some contacts with people who work at the flight company which has the monopoly over the northern Canadian territories and he said the chances might be very big that I could be sponsored by them. �I think those guys would be nuts not to take you up on it,� he wrote me. But then Jeff knew people on that 1000km road that would be able to let me stay for a night and the next day I could stay in the hotel Jeff owns in Fort Providence. So you can understand I was a bit hyper when I finished that conversation and got back to the real world with Maddi and Jeffrey. I�ll keep you posted on these developments! Then is was already time to join along with Maddi on her weekly volleyball games in the small town 100 Mile House (it�s a town nearby). When Maddi told me she always goes to play volleyball on Tuesday nights, I immediately told her I would love to come along. Ready for a sportive night out, dressed in my jogging suite, I run on my sporting shoes into that big gym hall. There were some 25 other adults and they all had formed four teams that play against each other twice in the coming two hours. Without any formal introduction, I was placed in a team and the balls were served! This was so much fun! I was playing volleyball with the locals of 100 Mile House and it was all about the game[/b]. About getting that one ball, playing that nice serve and blocking that person at the net. I love it. I am very much an amateur in volleyball, and to play the game like this, encircled by other better amateurs and semi-amateurs, gave me a good reason to start sweating a lot! Around 9pm we finished up and all teams had played against each other. It really refreshed me (and might give me muscle pain tomorrow morning too)! Back home we had a late dinner as we just rushed things up early this evening. Maddi had prepared oven baked chicken stew with potato soup and tomatoes. The work out of this evening really made me feel good and I was totally awake. With a few cups of coffee I was ready to write some previous reports this evening, as Maddi and Jeffrey got online on their own computers. While working independently on our own, be had some interesting talks about travels, internet graphic designs and funny movies on the web. However, I couldn�t make it too late, tomorrow I�d head up north again. Good night 108 Mile Ranch!